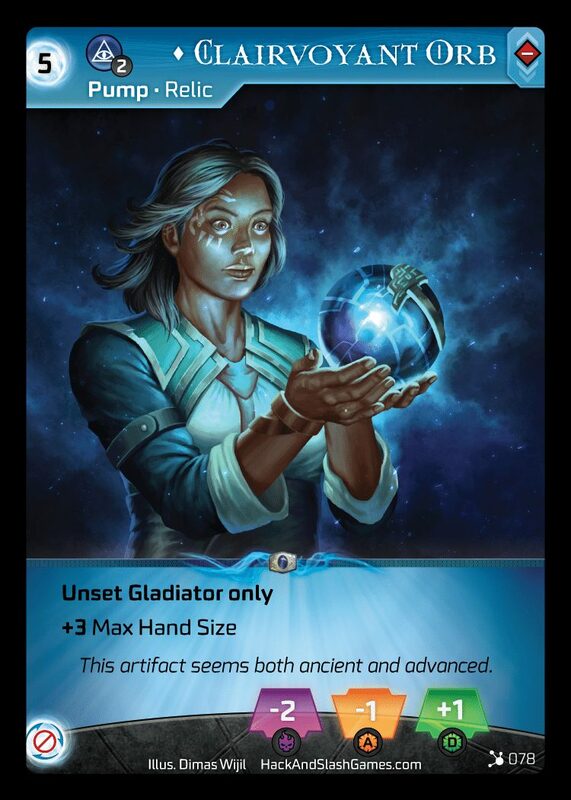 Let’s start with the obvious stuff… if you put it on your Gladiator, they let you draw more cards, Rage easier, and add Defensive Damage, all for a slight reduction in Attack Damage. Paying 5 Resources to get 3 extra cards on your next turn isn’t so bad. Remember, you draw cards during the Regenerate Step, and this card doesn’t go away until the Maintain Step! In a pinch, this card can help to stifle an opponent’s Attack a bit, and if you can finish off the Gladiator it’s on before the Breather, you won’t have to worry about giving them extra cards! When paired with other cards that affect your stats, this card can really add some extra punch! Finally, it’s Unique, so sometimes playing this makes sense just to prevent your opponent from playing theirs!